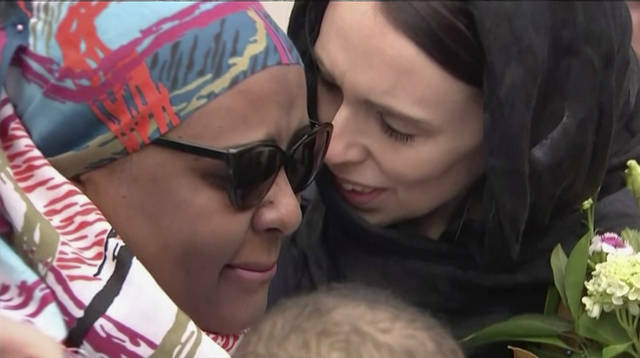 CHRISTCHURCH, New Zealand (AP) — The attributes that helped Jacinda Ardern rise to become New Zealand’s leader at age 37 include her optimistic outlook and bright personality. And she became an inspiration to working women around the world last year when she gave birth to a daughter, Neve. 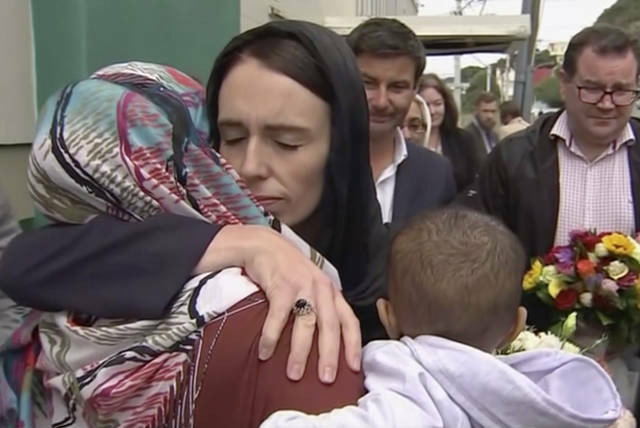 But the prime minister is now displaying other qualities to an anxious nation after a gunman on Friday slaughtered 50 people at two Christchurch mosques. She’s shown a determination to change gun laws and a deep empathy with the families of the victims and the Muslim community. She demanded her intelligence agencies explain why they knew nothing about the gunman, who emailed a manifesto outlining his plans to Ardern’s office minutes before the shooting. Friday’s events were the first major test Ardern has faced since she became prime minister in a contentious general election in 2017. She had only become leader of the liberal Labour Party a few weeks earlier when the party had slumped to its lowest-ever poll rating. PITTSBURGH (AP) — The Pittsburgh synagogue that was the site of a shooting massacre that left 11 worshippers dead has started a fundraising campaign through GoFundMe to support New Zealand’s Muslim community. An Australian white supremacist is charged with killing 50 people at two mosques in Christchurch, New Zealand, during Friday prayers. The synagogue said it recalls “with love the immediate, overwhelming support” it received from Muslims in Pittsburgh. The Jewish Federation of Greater Pittsburgh is also raising funds. A gunman who expressed hatred of Jews is charged in the Oct. 27 synagogue attack. Disclosure statement: John Battersby does not work for, consult, own shares in or receive funding from any company or organization that would benefit from this article, and has disclosed no relevant affiliations beyond their academic appointment. Partners: Massey University provides funding as a member of The Conversation NZ. Massey University provides funding as a member of The Conversation AU. Disclosure statement: Timothy D. Lytton has provided expert consulting services to law firms representing gun violence victims. Partners: Georgia State University provides funding as a founding partner of The Conversation US. The Connecticut Supreme Court ruled on March 14 that families of the Sandy Hook Elementary mass shooting victims could proceed with a lawsuit against the companies that manufactured and sold the semiautomatic rifle used in the attack. The ruling, which reversed a lower court’s decision, has the potential to unleash a flood of claims by gun violence victims against gun manufacturers – if it’s upheld by the U.S. Supreme Court, that is. My research on the history of lawsuits against the gun industry has documented the failure of gun violence victims to hold gun manufacturers liable for legal marketing practices that many people consider irresponsible. The latest Sandy Hook decision could pave the way for gunmakers to finally be held responsible for them. A 2006 law called the Protection of Lawful Commerce in Arms Act grants gun manufacturers immunity from lawsuits that arise out of the criminal misuse of a weapon. The Sandy Hook families argued that their lawsuit fell under an exception to this federal immunity. The exception allows gun violence victims to sue a manufacturer who “knowingly violated a state or federal statute applicable to the sale or marketing” of a firearm. The families claimed that Remington Arms “marketed, advertised and promoted the Bushmaster XM15-E2S for civilians to use to carry out offensive, military style combat missions against their perceived enemies.” They said that this marketing constituted an unfair trade practice under Connecticut law, which they argued is a state statute “applicable” to the marketing of a firearm. The Connecticut high court agreed and, importantly, interpreted the term “applicable” broadly. That is, the court said that a relevant statute only had to be “capable of being applied” to gun sales, not that the law needed be specifically about firearms, as other courts had held. It is this interpretation that could potentially unleash a flood of lawsuits across the country. Since many states have unfair trade practices laws like Connecticut’s, it seems likely that gun violence victims will bring similar claims elsewhere. Victims are thus likely to allege that a gun manufacturer’s aggressive marketing of combat-style weapons violates a state statute – like an unfair trade practice law – that is applicable to the sale or marketing of a firearm. The fate of the Sandy Hook lawsuit and any others that follow will depend on the outcome of an all-but-certain appeal to the U.S. Supreme Court. If the court rejects the Connecticut Supreme Court’s broad interpretation of the word “applicable” in the federal statue, that will restore the immunity from suit that gun makers have enjoyed for more than a decade. However, if the top U.S. court adopts Connecticut’s broad interpretation, then the gun industry can expect to be the target of a great deal more litigation in the years to come.